Spendor first emerged from the BBC Research culture some forty years ago. It has been through numerous changes since then, but that original culture seems to have largely survived, albeit somewhat modified by marketplace trends, including the current fashion for floorstanders. 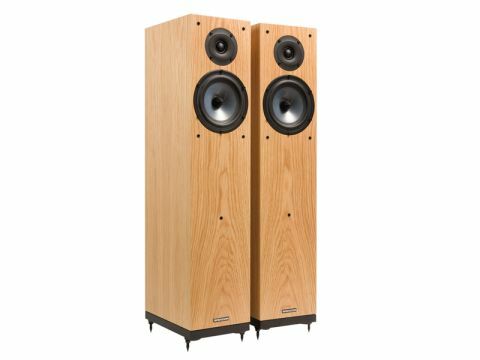 This £2,095 per pair A6 is the middle of three floorstanders that make up the company's A-series successors to the S-series. Very similar in many respects (including dimensions and measured behaviour) to the S6e we reviewed in HFC 257, it's a good size two-way floorstander, dressed in real wood veneer (black ash, cherry, light oak or wenge) and mounted on a blackpainted MDF plinth the same width and depth as the enclosure proper. Inside, the enclosure is kept as free from damping materials as possible, relying instead on small strategically placed polymer blocks to absorb unwanted energy. The bass/mid driver is reflex-loaded by a large 'linear-flow' port on the rear at floor level and a very clever arrangement, using substantial steel discs, enables the spikes to be firmly fixed close to the edge of the cabinet, ensuring good physical stability. The main driver here has a fairly large 180mm cast-alloy frame, but a pretty standard 120mm diameter cone; this has a flared profile and is formed from ep38 plastic. The tweeter has a quite large 29mm doped fabric dome with an unusually wide surround. Signal is applied via a solitary pair of WBT terminals and silver-plated copper cables to a 4kHz crossover with audiophile-grade capacitors. Tapped autochoke inductors allow the compromises involved in using attenuating resistors to be avoided. No port blocking arrangements are available here, so the A6 should be kept well clear of walls. The listening panel gave the A6 good marks, praising its overall coherence, fine timing, a high standard of clarity, and a wide dynamic range. Voices were well formed and projected, though they did err a little on the smooth and polite side and had a slight tendency to lose a little texture and grain. The tonal balance might have been more neutral – the slightly 'pushy' upper mid and reticent treble were both identified, but neither was considered unpleasant and the ears quickly and easily adjusted to this mild degree of 'character'. While it might certainly have been smoother – slight 'one note' tendencies were apparent at times – the bass gave a good impression of scale and weight and provided a firm foundation with convincing dynamic expression. Despite slight forward tendencies on some tracks, the stereo image showed good width and was praised for decent depth and the nice sense of space and air that was developed around individual instruments. Hands-on work largely confirmed the panel findings. The A6 does impose a little of itself on the sound, but its slight vocal forwardness is well balanced by an innately smooth and polite character. The A6 is a worthy successor to the S6e, with which it has much in common. There are some minor grounds for criticism, but the total package is very well-founded and above all, entertaining.